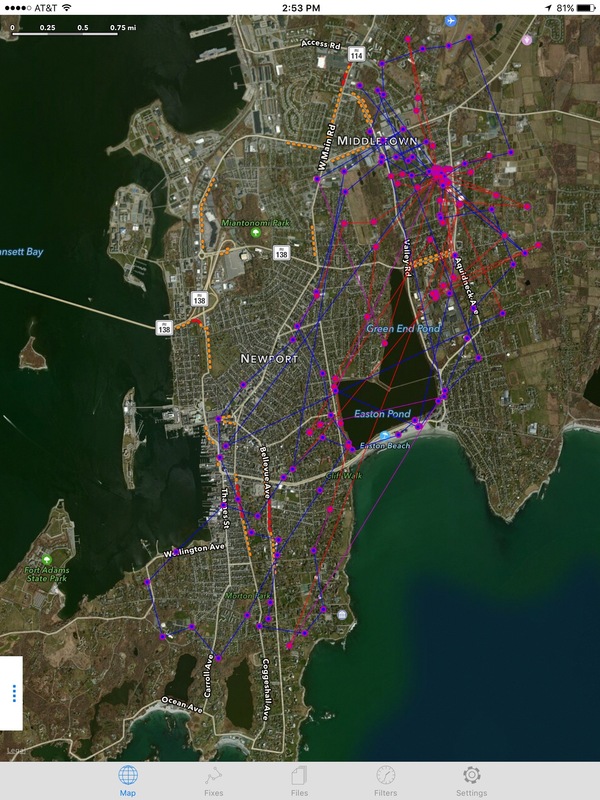 NBCS trapped and GPS-collared a coyote in Newport, on December 8, 2015. He was nicknamed “Cliff” for his capture location, Cliff Avenue. He also goes by “collar 39378” but Cliff is easier to remember. When we caught him he was about a eight months old: born in April with at least 5 other pups. Most pups have a short lifespan. They are often hit by cars and those that survive usually disperse to find a new pack when they are about 9 months old. By December Cliff was seen with only two other coyotes: the “alpha male,” likely his father, and a female. From motion activated camera counts of the family members at one of our trap stations in eastern Newport last winter, and sightings since, we estimate Cliff’s pack consists of 4-5 adult coyotes. In general the alpha male is the only breeding male in a coyote pack. He has one mate, the “alpha female.” They remain a pair until one or the other is displaced from the pack or dies. Each fall most of last year’s litter are gone and the pair gets ready to breed. Sub-adult pups that remain with the family are called “betas,” second string coyotes, some of whom become dedicated caretakers for next year’s litter of pups. From tracking and surveillance we know that Cliff became a beta, in charge of procuring food by night and, basically, babysitting during the day. The new pups, born in April, 2016 were quickly weaned and, like all coyote pups, rested near a den waiting for the parents and betas to return with food. It is common for 7 pups to be born on the islands. Pups grow quickly and they are difficult to keep fed. Cliff’s movement paths (see map) show him traveling back and forth to the pups all spring. When a beta like Cliff arrives with a full belly the pups crowd around his face and he regurgitates his food for them. A week of Cliff’s travel in July 2016 as shown by connecting sequential GPS positions. Nighttime movement is shown in blue, daytime red. He travels back and forth to the location of the pups: the cluster of red to the north in Middletown. His nightly route takes him by food resources at restaurants, fish piers, and places he gets fed in Newport in the southern part of his pack’s territory. Data and photo from NBCS. As the spring wears into summer, and the pups are completely weaned, the adults have to work longer hours to keep them fed. For Cliff that meant commuting back and forth to places he found food. By July, Cliff was spending most of the night foraging and had a regular nighttime route through Middletown and Newport restaurant districts checking for open side-doors of dumpsters or other unsecured trash and edibles around town. In the morning he headed back to the pups. As the pups gained weight and needed more food, he began to return home later in the morning. Rodrigo Fernandez, Andes Visual Films, was able to capture footage of Cliff in daylight as he returned to the pups each day. Through our tracking Cliff, and other GPS-collared coyotes, have shown NBCS, and police, places he routinely goes for food people provide. Education and, if necessary, implementation of the No-Feeding Ordinance has allowed us to shut down and clean up major sites. We suspect, however, that many commercial dumpsters are still accessible to coyotes, an we are convinced that scattered residents are feeding them. Occasional feeding by residents is much harder to pinpoint. Here augmenting reports from community residents help us find feeding and shut it down. If you notice intentional or unintentional feeding please report it. Feeding makes coyotes less hesitant to be seen by people and more likely to beg by staring at people. If you see Cliff, don’t be unnerved, act big, mean, and loud. He is still has a fear of humans as do most coyotes. If you haze him by yelling, clapping, and throwing things, he will take off when he understands you are not interested in feeding him. Try “GET OUTTA HERE!” at top volume. That’s what we yelled when we peppered him with rubber buckshot and chased him using NBCS ACT (Aversive Coyote Tactics). We hope he learned what that phrase means, but we may need to repeat the lesson. Please let us know how he behaves if you see him and haze him. With community help we hope to reset his behavior and train him to steer clear of people. Please report sightings, submit images here, or add a post or comment to our Narragansett Bay Coyote Study Facebook page.